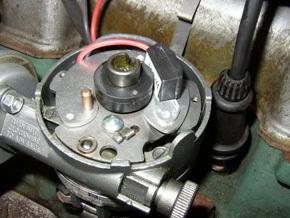 For a couple of years the P3 suffered from sooting up plugs and general rough running that was very hard to pin down. Over the past year this had developed into a habit of cutting out completely for no apparent reason. All the obvious things had been tried, coil, points, condenser, carb jets, fuel pump, plugs, leads, distributor cap, rotor arm and I cannot remember what else. Anyway, a couple of months ago I got to the bottom of it. 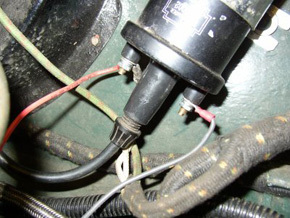 The flexible wire that connects the LT to the points had broken at the point where it is crimped onto the square tag which is then secured to the bolt through the distributor body. The wire looked intact but was actually broken between the two parts of the crimp. It is a little difficult to describe but I am sure that anyone looking at this tag will see what I mean. As the distributor was showing it's age I decided to give it a complete overhaul but due to a lack of time & expertise and feeling a bit flush I decided to send it to Holden's for a proper overhaul. By the time it came back I must have had a rush of blood to the head because I had arranged to have a Pertronix unit as well. However, the UK dealer was not sure which unit would fit the P3 distributor so, when it came back looking like new, I then sent it to him. It arrived back a couple of weeks later with the correct Pertronix unit (LU-168) already fitted and the nice new points, condenser etc., so carefully fitted by Holdens, removed and in a plastic bag! 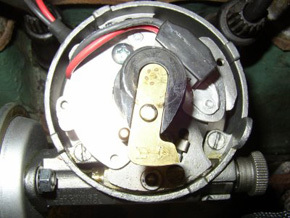 The LU-168 unit is correct for a negative earth 6-cylinder P3, anyone considering one of these units for a 4-cylinder or positive earth car would need to ask for the equivalent. 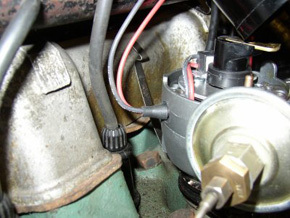 I have now fitted the distributor back into the car. Setting the timing was a bit of guess work at first, once it was running I set it up to original timing using a strobe onto the timing marks on the flywheel. The man that decided to mount the SU fuel pump on the scuttle had obviously never tried to time a car using the timing marks. It is almost impossible to get a clear view of the timing marks and point a strobe at them at the same time because the pump gets in the way. Due to the weather in the Lake District, particularly at this time of year, and my (work) shift pattern, the car has only had a couple of runs since but it is running much better, pulls very well up the local quite steep (1 in 4) hills and starts easily. Only time and a couple of long runs will tell but I am sure I have corrected the problems that have been spoiling my enjoyment of the car recently. The whole experience has been rather expensive but what the heck, you can't take it with you.